Lawful: Will never use a desire path. Neutral: Will use a pre-existing desire path. Chaotic: Will start a new desire path. Don't forget, Paul and I plan to have a new "Wandering DMs" livestream scheduled on YouTube this Sunday Dec-23 at 1 PM EST. Feel free to chime in with a comment during the discussion and also subscribe to the channel -- if we hit 100 subscribers it unlocks extra tools for us to manage and offer to any followers, which sounds nifty. See you then! Edit: Due to a technical issue, we should be streaming later this evening, we expect around 5:30 PM. Question: In what proportion do Gygaxian magic-users tend to prepare spells of different use-cases, such as offensive, defensive, or miscellaneous types? This may be of interest in loading out wizard-types in the same sensibility as the original game designer. Obviously it doesn't make sense for wizards to sit around without any martial spells at all, nor would it make for an interesting game. On the other hand, there seems a need for wizards to have some spells usable for things like information-gathering and research, since presumably they are engaged in that most days in their lair, not combat. Methods: What I've done below is scan through the main Gygaxian adventure line -- the T-G-D module series -- and make a tally of all the spells explicitly prepared by the magic-users there. This includes predominantly humans and Drow, as well as tournament PCs given in the 1981 publications. The coding to O-D-M (offensive, defensive, and miscellaneous categories) has attempted to follow the example in AD&D DMG p. 39 for wizard 1st-level spellbooks. Notably, in the "defensive" category we include any type of barrier or travel spell (per DMG p. 39: hold portal, jump, spider climb, feather fall). The "miscellaneous" category is predominantly information-gathering spell (e.g. : comprehend languages, detect magic, identify, message, etc. ), as well as some other types. Conclusions: We found 18 magic-user types in this search. Broadly speaking, looking at the total percentages in the lower-right of the table, we can say that offensive-defensive-miscellaneous spells appear in a ratio of about 3:2:1 (suitable for d6 rolls). Initially I expected a higher proportion of miscellaneous type at the lower levels, but this is not borne out: e.g., percentages for offensive spells by level run 62-42-59-62-45-60%, with no consistent pattern. Follow-up questions could be to detect patterns in load-out in terms of relative highest level per caster, or for bias compared to overall proportions in the rulebook spell roster, but these seem unlikely to be productive. One thing I did look at was the few cases where spell books are specified for these magic-users, beyond just the spells they have memorized (N = 4; Burne, Falrinth, Deggum, and Senshock). In these cases, the proportions seem flipped for the additional spells: roughly in proportion 1:2:3. The number of added spells in one's book varies between about 100% and 200%, with an average close to 150% (somewhat higher than I might have initially guessed). It should be pointed out that my list only includes spell levels 1-6, because (a) I'm mostly interested in the context of use for an OD&D game, and (b) only one caster in the series above has spell levels 7-9 (namely the lich Asberdies lurking in D1). Another observation is that the total number of detailed magic-users is itself smaller than I might have expected; to a large degree, Gygax's go-to spellcasting bad guys are predominantly evil clerics. (e.g., temple in B2, Lareth in T1, commander in T2, female Drow leaders in GDQ, etc., etc.). This is somewhat interesting in contrast with the near-nonexistence of spellcasting priest-types in the pulp literature (which I've written about on this blog too many times to count, perhaps). I got together with my good friend Paul (of Paul's Gameblog) for a project we've been kicking around for a few years now; an online, live-streaming conversation about old-school gaming, and the various always-interesting ways in which we agree and differ on philosophies, rules, strategies, and so forth. We decided to dive in head-first here and get something online as an experiment this weekend; I'm sure we'll be testing and adjusting things like pace, visuals, lighting, audio levels, name of the series, etc., as time goes on -- but I always enjoy conversing with Paul, and if you're a reader here, then I think you will, too. This first episode tries to wrestle with the foundational question, "What is Old-School Gaming?". Our current plan is to be live on YouTube every other Sunday at 1 PM EST (next episode Dec-23). Feel free to chime in here, or there, if you have suggestions for improvements or topics you'd like to see us hash out. I'm pretty excited about this! One of the critical observations that I've made in the 7 years since releasing the first edition of the Book of War mass combat game for D&D (see sidebar) is that missile fire is definitely not scale-invariant. That is, at a given range (say: max range for a longbow), an individual firing at an individual may find it effectively impossible to hit, whereas at the same range an army firing at another army may find it effectively impossible to miss. So using the same range modifiers for both cases doesn't make sense. Note that there are three armor categories here: Unarmored, Half Armor, and Full Armor. (We can very broadly correlate these to the D&D Leather, Chain, and Plate types.) The hit rates vs. Unarmored figures are very consistent: between 44-49% in any row. The Half Armor types are radically variable: 0% in the first row and 32-36% in the last three rows. Full Armor is somewhat less variable: 6-16% depending on which row your situation falls into. Again, note that range modifiers do not apply; the same chances apply for any target within maximum range of a shooting force. 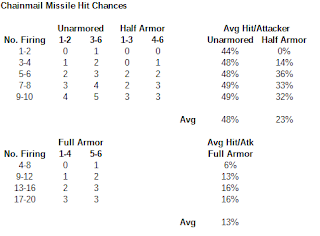 If we convert this to a simplified and uniform roll-one-die-per-figure mechanic, then we could approximate these values this way: say, 3-in-6 (50%) to hit Unarmored, 2-in-6 (33%) to hit Half Armor, and 1-in-6 (16%) to Full Armor. That's slightly generous on average to the Half Armor case, but seems like a nicely coherent mechanic. 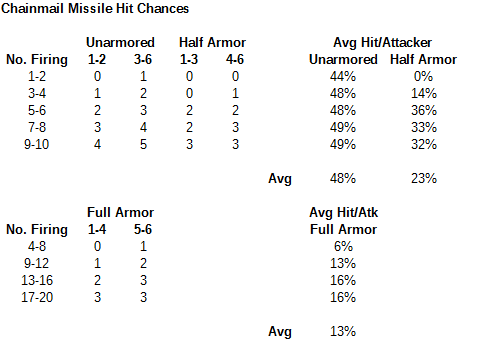 That also just happens to be the same hit chances as seen in the core rules to Book of War (sans ranged modifiers, of course). But if we do go in this direction, then it may be a requirement to include rules as in Swords & Spells which reduce hit rates against small unit (or individual) targets.